Australian forward Gabe Hamlin is hoping for the chance to prove himself against the NRL champions - after missing out on the Grand Final squad. The 22-year-old joined the Warriors from South Sydney, where he made 47 appearances for the club's under-20s side, and is desperate to face their old rivals Sydney Roosters at the DW Stadium on Sunday. 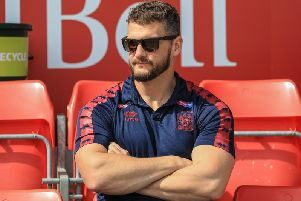 Hamlin, whose two-year contract runs out this year, is expected to be on the bench after catching the eye of new interim head coach Adrian Lam as a substitute in Wigan's opening two Super League games. "I hope so," said Hamlin, nicknamed 'The Hammer'. "It would be pretty disappointing if I wasn't but I'm sure whatever Lammy does, it will be the best for the team. "It would be nice just to show to both leagues - if I was to choose to go back home or stay here - that I can step up in that game and I could handle myself. "There's a bit of pressure on me but I like that. It's going to be a big game for me just to prove I could play in that league." Hamlin made 18 appearances in his debut season in Super League, including 15 in a row up to the play-offs, but was dropped for both the semi-final and Grand Final, for which he was Wigan's 18th man. "I was happy with my first season in Super League," he said. "I was a bit unfortunate I think not to play in the Grand Final but I used that as motivation. "If I ever got the chance again, I wouldn't want to be 18th man. It was a good feeling to win but it's different when you're not playing." Lam says he has been impressed by Hamlin' performances against St Helens and Leeds. "Gabe has been one of our highlights for us coming off the bench," Lam said. Lam is still sweating over the fitness of centre Dan Sarginson, who rolled an ankle in the win over Leeds, while a foot injury to the Rooosters' first-choice stand-off Luke Keary could pave the way for the coach's son, Lachlan Lam, to make his debut. Trent Robinson's squad arrived in Paris on Monday to set up a training camp and will play a training match against St Helens behind closed doors at the Totally Wicked Stadium on Friday. The game was arranged last October after Saints coach Justin Holbrook met up with Robinson at leaders conference in London. Meanwhile Wigan, say two stands are close to being sold out as they aim to at least top the 21,011 crowd for the visit of Cronulla in the 2017 World Club Challenge at the DW Stadium.